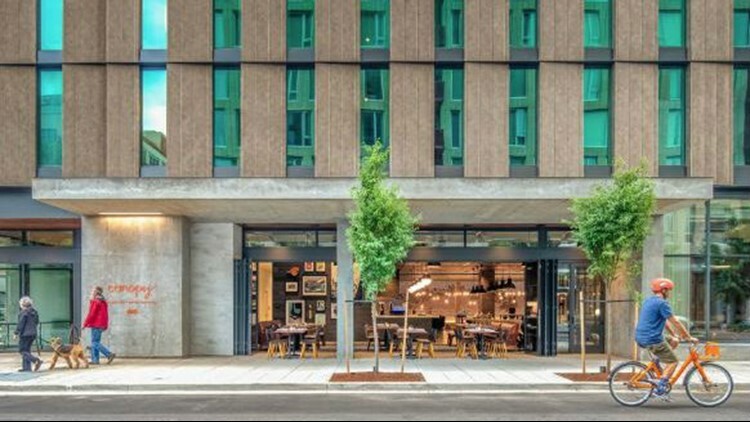 One of Portland's new hotels is the Canopy by Hilton. The Canopy by Hilton, a "lifestyle hotel brand" from Hilton, opened its doors at the end of July. It was nearly four years in the making, but a new hotel in the Pearl District is now officially up and running. The Canopy by Hilton, a "lifestyle hotel brand" from Hilton, opened its doors at the end of July. The 153-room hotel sits at 425 N.W. 9th Ave. It comes from a partnership that included local real estate firm Menashe Properties, as well as PM Hotel Group, the Buccini/Pollin Group and Canopy by Hilton. The Menashes are also part owners of the new hotel. "It's the first hotel we've done," said Barry Menashe. "We're really glad to have been a part of it." The partners behind the hotel announced the project in November 2014. Construction began in 2015, and the hotel officially celebrated its opening at the end of July. The brand, a relatively new one for Hilton, focuses on capturing neighborhood-specific styles while incorporating local food, beverage and art offerings. All of those are part of the new hotel in Portland. Local firm ZGF Architects designed the exterior of the hotel, while Mark Zeff handled interior design.